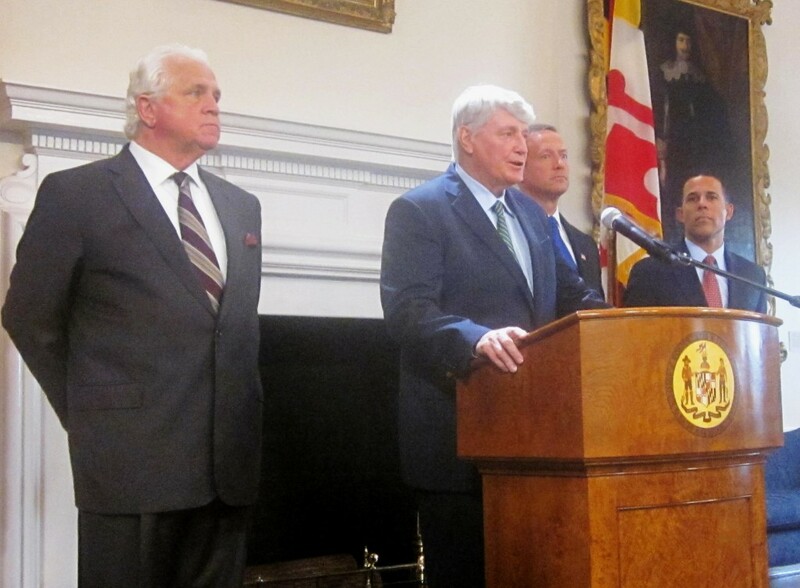 From left: Senate President Mike Miller, House Speaker Michael Busch, Gov. Martin OMalley, Lt. Gov. Anthony Brown announcing special session. Maryland has some of the lowest taxes in the country, Gov. Martin O’Malley said Wednesday officially announcing plans to call a special session of the legislature to fix a budget impasse — partially by raising taxes. Maryland has “the third lowest state and local taxes as a share of income,” O’Malley said, partially because residents have some of the highest incomes in the nation. The state has “the ninth lowest sales tax,” he said, a figure he’s cited several times this year as he’s proposed applying the sales tax to gasoline. Also, it has the eighth lowest business taxes on mature firms and the 12th lowest rate on investments in new firms. “According to the American Tax Foundation, the citizens of Maryland already bear the brunt of the nation’s fourth heaviest tax burden,” Pipkin said in a release Wednesday. Surprisingly, according to the governor’s press office, O’Malley and Pipkin rely on some of the same sources for their information, including the Tax Foundation, a longstanding tax-adverse group whose data is frequently used to berate Maryland for its high taxes and bad business climate. The Tax Foundation calculates the number differently than the Tax Policy Center and ranks Maryland as 12th highest in the nation for state and local taxes as a percentage of state income. In the Tax Foundation calculations, Virginia ranks 33rd; Pennsylvania, 10th; Delaware, 23rd; D.C. is 24th, and West Virginia, 27th. But the percentages cover a very limited range with Maryland taxes at 10% of personal income (tied with Massachusetts); Pennsylvania is at 10.1%, and Virginia is at 9.1%. The state with the highest tax burden is New Jersey at 12.2%. According to the tax foundation, Maryland fairs much worse on tax burden per capita, coming in 5th at $5,218 for every person in the state. Virginia is 13th at $4,392; Pennsylvania, 15th, $4,190; Delaware, 17th, $4,091; D.C. is 3rd, $6,076; and West Virginia is 44th, $3,034. The Tax Policy Institute ranks Maryland 10th in tax collections per capita (again a slightly different number). In its annual State Business Climate index published in January, the Tax Foundation does indeed show Maryland with the 9th lowest sales tax. But that is part of a chart that ranks Maryland among the 10 worst states for business climate. In this year’s chart Maryland moved up to 42nd place from 44th place last year “due mostly to the expiration of the state’s ‘millionaire’s tax’ on high-income earners,” said Tax Foundation economist Mark Robyn. In a separate, more detailed analysis of state taxes on business, the Tax Foundation does rank Maryland 8th in its overall taxes on “mature firms.” Another study by the Ernst & Young accounting and consulting firm ranks Maryland 12th in the country on the effective tax rate on new investments in selected industries. Calculating taxes on new firms in a very different way, the Tax Foundation ranks Maryland 46th in the country on taxes paid by new firms – fifth from the bottom. Maryland comes in dead last on what used to be big enterprises here – capital-intensive industries such as steel plants. But in the end, because the House of Delegates won’t go along with a broader tax increase backed by the state Senate, the new tax rates will raise about $250 million for the next fiscal year, retroactive to Jan. 1. Single taxpayers having taxable income from $150,000 to $500,000 and joint taxpayers with incomes from $225,000 to $500,000 will see the biggest rate hike, 0.5% — figures 10% higher than their current rates. Exemptions in those brackets will also be cut, which will provide $31 million in additional revenues to the counties as well. Combining the new rates with the top local piggy back rates of 3.2% would bring Maryland top rates to almost 9%, putting it among the top 10 states for its state and local income tax rates.